Tonight when I went to feed the horses a beautiful double rainbow hovered over the barn. I looked for the pot of gold — always a useful thing to have with horses around — but the only thing framed by the light was them. One of the things I love about taking care of the horses myself is that it gets me outside and connected to them. Today I was busy from the moment I woke up to the time I got home — about a 12 hour span — but twice during the day I spent a few minutes with Zelda, Curly and Freedom. I heard their galloping hooves responding to my whistle for meals, enjoyed some appreciative nickers, and breathed in the heat of the morning and the coolness after the rain. My iPhone didn’t do this rainbow justice. 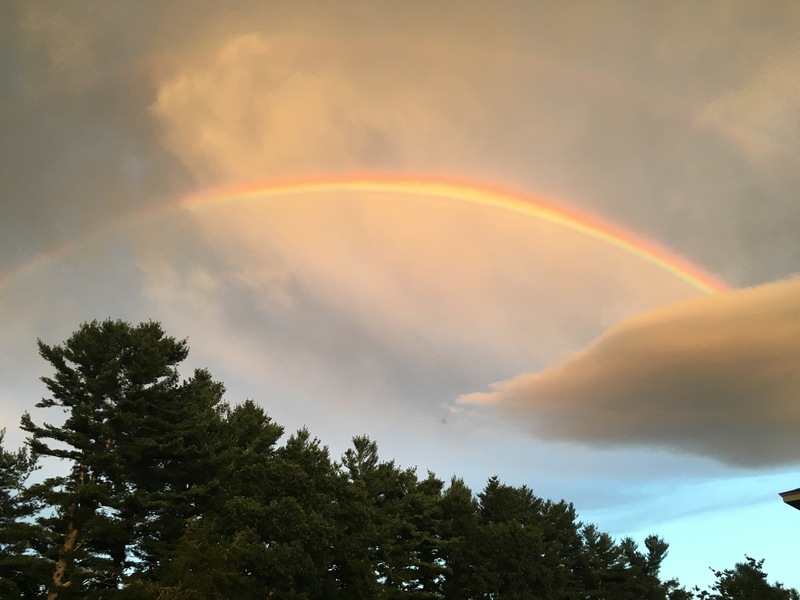 In real life the sky glowed and there was a second bow shimmering above the first. To think I might have missed this sight had I not been out to feed. So maybe Suzie got the pot of gold?